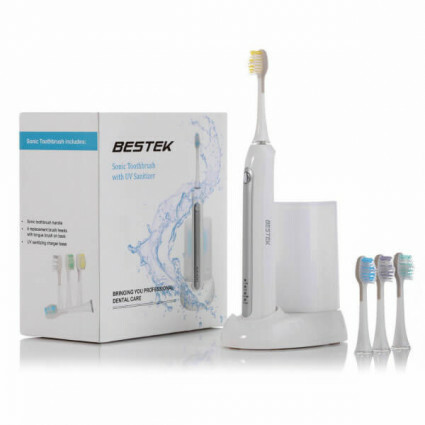 BESTEK electric tooth brush is designed with advanced sonic technology to drive fluid between teeth and along the gumline to reduce the need for flossing. The sonic toothbrush has 3 brushing modes and comes with a UV Sanitiser unit to keep brush clean from bacteria. The electric toothbruch is perfect for cleaning, whitening and stain removing. Four brush heads are used to clean your clean your different teeth; silicone brushes makes it comfortable when cleaning and also helps to remove tongue bacteria. Automatic and smart with two-minute brush timer setting and 30-second time intervals to clean your teeth effortlessly and efficiently. Comes with integrated UV Sanitizer to keep brush clean and kill 99% bacteria. UV tube can automatically light up when placed on the chamber and shut off after 6~8 minutes.